Stamped concrete driveways give you a vast array of decorative options not possible with other paving materials. Using stamps, you can create cost-effective replicas of popular materials such as cobblestone, brick, natural slate, and field stone. And unlike stone or precast pavers, a stamped concrete driveway can be poured or pumped into place without the need to lift and place individual units, saving significant time and labor. Beyond the endless array of patterns and textures available, coloring methods such as stains, integral color, and powdered pigments will give your stamped concrete an authentic look. 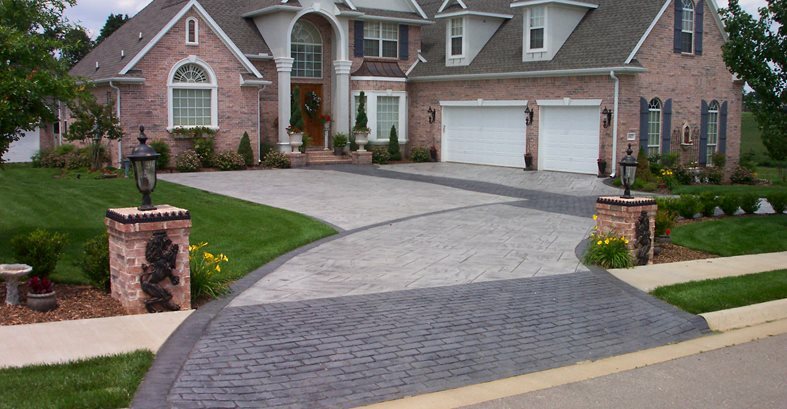 Contractors can also customize the color of your driveway to complement your home and landscape. 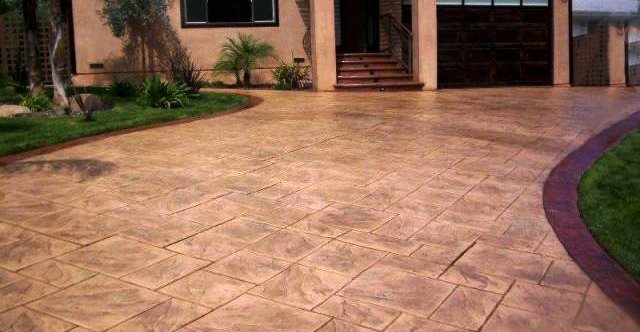 Here are some other ideas for tailoring the look of a stamped concrete driveway to suit your design and budget requirements. Use borders and bands in contrasting colors and patterns to add decorative interest. If you simply want to give your driveway a stone-like texture rather than a clearly defined pattern, use seamless texture skins to impart the look of natural rough-cut stone. 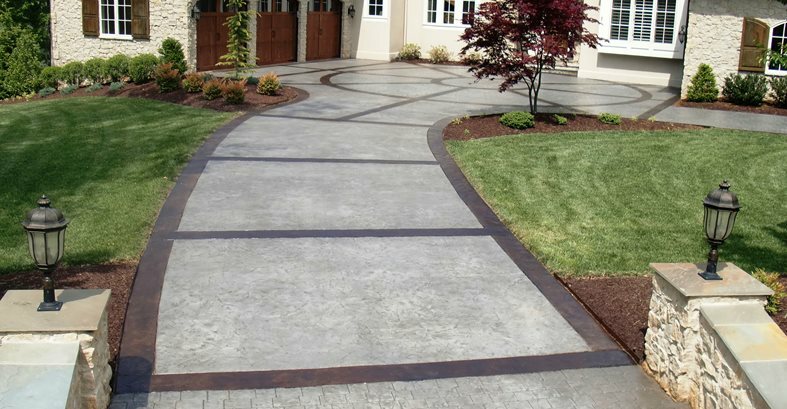 Instead of using stamped concrete for the entire driveway, install stamped borders combined with fields of exposed aggregate or broom-finished concrete. This combination is very appealing yet more affordable because of the savings in labor and material costs. 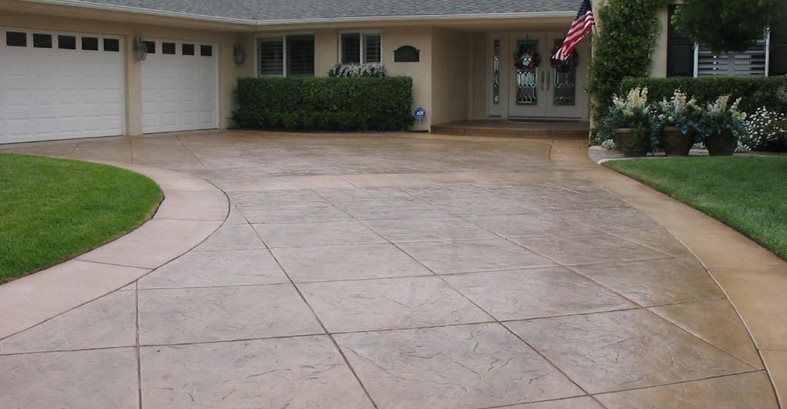 Even if you have an existing concrete driveway, it’s possible to give it pattern and color by resurfacing it with a stampable concrete overlay. For the greatest curb appeal, choose patterns and colors that complement the architectural style of your home. Stamped concrete benefits from added color because it can make the pattern look more realistic. But you don't have to do a lot to make a big impact. Save money by using just one primary color with some antiquing accents rather than applying multiple layers of color. This stamped concrete driveway blends in beautifully with the color scheme and style of this two-story brick home. A seamless granite pattern was used for the entire project, including the borders and bands. The main fields of concrete were colored with a sand color hardener accented by a walnut release agent while the decorative borders were custom colored to match the home’s trim and shutters. These homeowners saved money by using integrally colored, broom-finished concrete for the main fields of their driveway and stamping the edges with a brick-patterned border. The borders were stained a burnt crimson shade to set them off from the lighter driveway color. 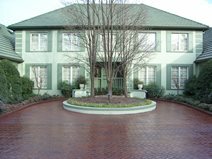 The focal point of this palatial home is the circular driveway directly in front, which is stamped and colored to look like herringbone brick pavers. For the driveway leading up to this area, the herringbone pattern and brick color were repeated every 20 feet, creating bands that tie the entire driveway together. 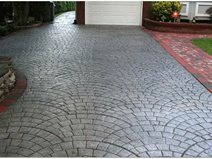 This driveway shows the impact that can be created by using just one pattern and color. The driveway was integrally colored with a silver pigment and accented by a charcoal powdered release agent. The European cobblestone pattern beautifully complements the red brick sidewalks and border.